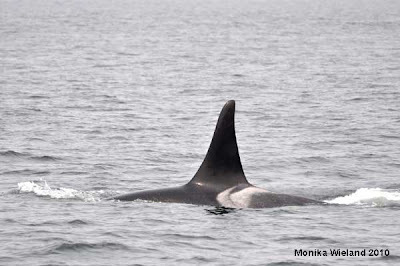 We had a couple of fantastic trips today aboard the Western Prince. This afternoon we headed out and as we made our way south down San Juan Channel stopped a couple of times to check out some harbor seal haul outs. Down in Cattle Pass, where we had seen a minke whale in the morning, we saw more seals as well as rhinoceros auklets, common murres, pigeon guillemots, pelagic cormorants, glaucous-winged gulls, mew gulls, and Heermann's gulls. What was that I said about this being a great time to bird in the San Juans?! 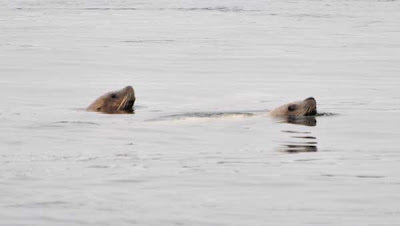 Our biggest surprise, however, was a group of four Steller sea lions swimming together in the water! We normally expect these guys to be around from September through May and occasionally see a single animal throughout the summer, but I've never seen a group of them here in the middle of the summer! Their population is on the rise, so maybe their range is expanding and we'll get a breeding colony of sea lions established around the island sometime in the near future. In terms of the orcas, we have had a strange combination of whales hanging out for the last day or so: K-Pod, half of J-Pod, and L87, a single L-Pod whale. 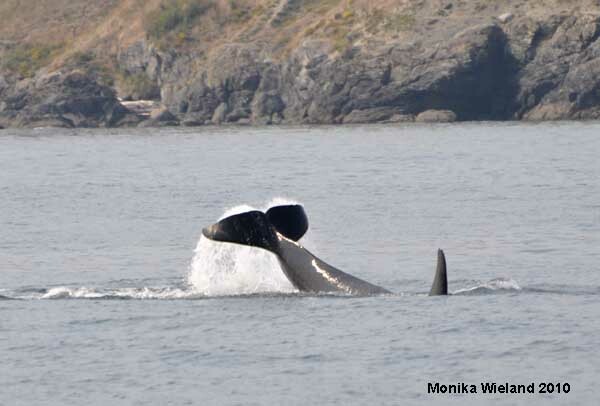 When we got on scene with the orcas a mile or two off of Eagle Point the first whale we came across was the eighteen year-old male L87 Onyx. 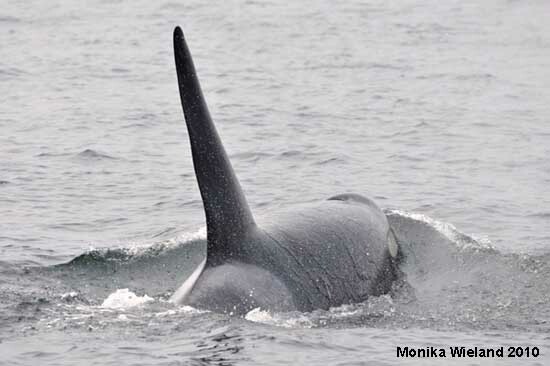 Onyx is an interesting whale who has basically become a member of K-Pod in recent years. I posted his intriguing story in a blog post last winter that you can read here. 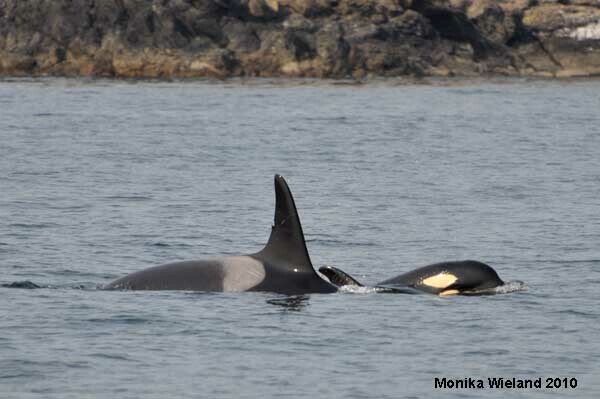 Polaris' sister J35 Talequah was also there with her young calf J47. 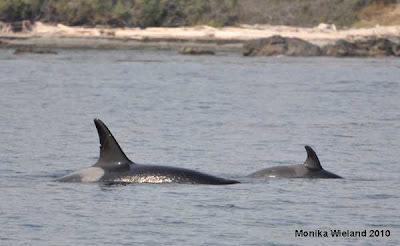 Several times we saw Talequah give a tail slap, followed shortly thereafter by her calf doing the same behavior! 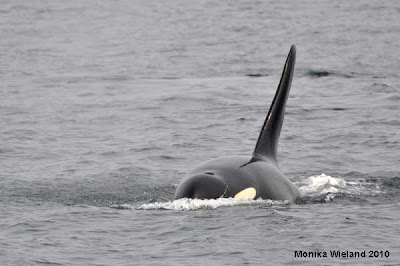 Last weekend Talequah was teaching her calf the spyhop. This week's lesson: tail slaps!